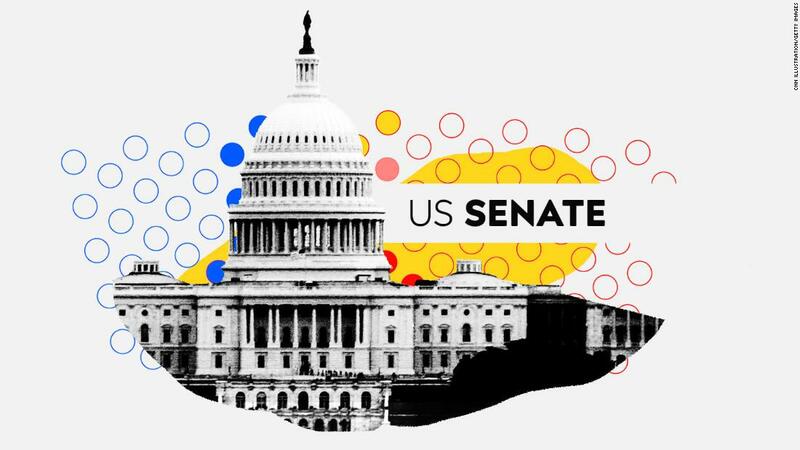 Washington (CNN) There are two months until the midterm elections in November and Democrats still have a narrow path to the Senate majority despite a map that favors Republicans and includes 10 Democratic incumbents running in states President Donald Trump won, five of them by double-digit margins. Another prime target for Republicans is Florida, where Quinnipiac University found Democratic Sen. Bill Nelson and Republican Gov. Rick Scott running even with 49% each after some $37 million in Television ads — roughly half of that by Scott’s campaign. Democrats are on offense in Nevada, a state Hillary Clinton carried by 2 points and where Rep. Jacky Rosen is now challenging GOP Sen. Dean Heller. The Battle Born State could be ground zero for the health care debate this cycle, with Rosen aggressively attacking Heller’s support for the GOP’s effort to repeal the Affordable Care Act. Republicans breathed a sigh of relief late last month when GOP Rep. Martha McSally emerged from a tough primary contest in Arizona with a convincing victory against conservative firebrands Kelli Ward and Joe Arpaio. But McSally’s shift to the right during the nominating fight, particularly on immigration, could pose a challenge in the general against Democratic Rep. Kyrsten Sinema, who entered the general election largely unscathed. The list of Democratic targets this cycle has doubled, with a pair of red states — Tennessee and Texas — looking increasingly competitive. With the Senate currently split 51-49 in favor of Republicans, if Democrats were able to win either of those contests — assuming they also flip Arizona and Nevada — it would mean the party could afford to see one of its incumbents defeated and still preserve a path to the majority. In Tennessee, former two-term Gov. Phil Bredesen is running a methodical campaign against GOP Rep. Marsha Blackburn by focusing on local issues and emphasizing his own moderate brand of politics over that of the national Democratic Party. That strategy seems to be working to his point, with an NBC News/Marist poll released Thursday showing Bredesen and Blackburn running neck and neck — 48% to 46% — among likely voters. Bredesen’s standing is buoyed by his popularity — 61% of likely voters have a favorable view of the Democrat versus 22% who hold a negative view of him. By comparison, 46% of likely voters view Blackburn favorably compared with 36% who do not. When it comes to the President, 47% approve of his job performance while 43% disapprove. Blackburn, a staunch ally of the President, is making the argument that electing Bredesen could give Democrats control of the Senate — a persuasive message in a state that went for Trump by 26 points. Bredesen has pledged to work with the President when he proposes policies that benefit Tennessee, declaring at the start of his campaign he was not “running against” Trump. Republicans are sending the cavalry to Texas for Sen. Ted Cruz, with the President announcing he’ll do an October rally for his former 2016 GOP primary rival, and the political arm of the Club for Growth launching a seven-figure television ad campaign to hammer Cruz’s Democratic opponent, Rep. Beto O’Rourke. O’Rourke has been a fundraising phenom, more than doubling Cruz in the second quarter and leading the GOP incumbent in cash on hand by almost $5 million. Polls show O’Rourke within striking distance of Cruz. The latest NBC News/Marist survey showed the race at 49% to 45% in Cruz’s favor. For Democrats, the path to victory in the Lone Star State has been elusive. The party’s last statewide win came in 1994. The last time Texas elected a Democrat to the Senate was 1988. Clinton lost the state by nine points — an improvement on Mitt Romney’s 16-point margin over Barack Obama in 2012. Having tapped into the Democrats’ enthusiasm edge, O’Rourke appears poised to narrow the gap even more this year. West Virginia should be at or near the top of the GOP’s targets this cycle based on Trump’s 42-point margin there in 2016. The President has also visited the Mountaineer State six times since taking office. The difficulty for Republicans is they are running against Democratic Sen. Joe Manchin, a popular two-term governor who has demonstrated a willingness to buck his party and support the President’s policies and nominees. He voted for Trump’s first Supreme Court selection, Neil Gorsuch, and has signaled he’s open to supporting Brett Kavanaugh, saying Wednesday he has not seen anything disqualifying from the nominee during this week’s Senate Judiciary Committee hearings. Manchin also has demonstrated he can win in a less-than-ideal environment, receiving 61% of the vote in 2012 even as Romney carried the state with 62% support. Republican nominee Patrick Morrisey, the state’s attorney general, has faced questions about his fundraising ability and Manchin has a six-to-one cash advantage. Morrisey only recently launched his first Television ad, a biographical spot that features praise from the President and highlights his legal challenge to environmental regulations implemented by the Obama administration. That comes after Democratic outside groups have spent the summer pummeling Morrisey on TV over his work as a “DC lobbyist” for pharmaceutical Companies and his decision to join a lawsuit challenging the ACA, a move that could lead to protections for pre-existing conditions being struck down. That line of attack could resonate in West Virginia, which at 36% has the highest rate of adults under 65 with pre-existing conditions, according to a Kaiser Family Foundation study in 2016. For a while it appeared Heitkamp was Trump’s favorite Senate Democrat. The President praised her as a “good woman” during a September 2017 event in the Peace Garden State and invited her to the White House in May for the signing of a bank deregulation bill she co-sponsored. Now it seems the President is all-in for Cramer. “You need a senator who doesn’t just talk like they’re from North Dakota, but votes like they’re from North Dakota. That’s what you need, and that’s Kevin Cramer,” Trump said during a Fargo rally in late June. Heitkamp should be able to keep the race close because of her strong personal brand and resource advantage — leading Cramer $5.2 to $2.4 million in cash on hand. Cramer’s bottom line should get a boost thanks to the President’s visit, which his campaign says raised over $1 million. Given Trump’s popularity in the state, Cramer’s unwavering support for the President could be a more potent pitch to voters than Heitkamp’s message of moderation. The national environment this year favors Democrats, but North Dakota is very much Trump country — and Cramer is Trump’s candidate. It’s been nearly 50 years since New Jersey voters elected a Republican to the Senate. Hugin has loaned his campaign more than $15 million and has spent more than $7 million on Television ads to boost his candidacy. Menendez has been saving his resources — holding about $6.4 million cash on hand. He’s also getting a little help from the Democratic Senatorial Campaign Committee, which recently teamed with Menendez on a joint Television ad buy. Democrats feel confident Menendez’s numbers will improve once he hits the airwaves. He also stands to benefit from several competitive House races in a state where Democrats have strong recruits.